A Liberal's Libretto: Happy Birthday, Fiorenza Cossotto. Still 'full throttle'. Happy Birthday, Fiorenza Cossotto. Still 'full throttle'. OK, ok, O. K. I have found myself getting flummoxed by the ridiculous nature of the Arizona SB 1070 discussion. To put it plainly, I need to calm myself down. 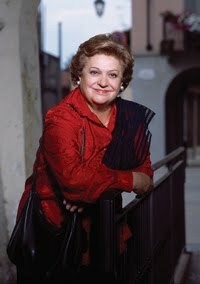 What better way to do that than to send belated Happy Birthday wishes to Italian mezzo soprano Fiorenza Cossotto [R. in 2006], who turned 75 yesterday. Cossotto, you'll remember as one of the reigning mezzos of the 60s, 70s and 80s, was born in Crescentino di Vercelli, Italy. She later attended the Turin Academy of Music and graduated top of her class. After studying with with Mercedes Llopart, she made her operatic debut as Sister Matilde in the world premiere of Poulenc's Dialogues of the Carmelites in 1957 at La Scala in Milan... she was 22 years old. The following year, she made her international debut at the Wexford Festival as Giovanna (Jane) Seymour in Donizetti's Anna Bolena... and her Covent Garden debut was in 1959 as Neris in Cherubini's Médée, with Maria Callas in the title role. More on the Callas / Cossotto relationship later. 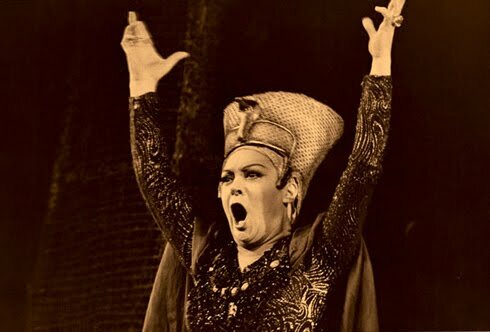 Cossotto made her American debut in La favorita in 1964 at the Lyric Opera of Chicago and as Amneris at the Metropolitan Opera in 1968. Altogether from 1968 - 1989, she sang one hundred forty-eight performances at the Met... all of which were leading roles, of course. Although a phenomenon in the heavier Italian mezzo roles of the middle 19th century - roles such as Favorita, Eboli [Left - 1977 Salzburg Easter Festival], Preziosilla, Maddalena, Ulrica, Laura, Azucena [Lower Right - 1973 with Robert Merrill at the Met] and Amneris [Bottom - 1985 at the Met] - Cossotto also ventured into Carmen, Mozart's Cherubino, and Urbain in Meyerbeer's Les Huguenots. She must have been doing something right because at the age of 70, Cossotto was still singing and, in fact celebrated her birthday with a performance of Suor Angelica at the Théâtre Royal in Liège, Belgium. The saying goes: Keep your friends close and your enemies closer... right? Let's just say Cossotto and Maria Callas had a very close relationship. Some say it was out of friendship while others believe it was another of Callas' rivalries. The subject of the Callas episode is one for which Cossotto has little patience. "But look, it's a disgrace! It's been forty years, and books still come out speaking ill of me. The first year, we did our rehearsals, and everything went well. Callas was in good voice. There was no reason for her not to do Norma, which was her war-horse. During the last two performances [in 1965], she was not well - she had a cold, which passed down [into the chest]. The last performance, poor thing, she couldn't say no, because all of Onassis's elite was in the theater. But logically, she couldn't [sing], because she had already sung two performances on the cold. You don't play with Norma! In the [first] duet, it goes up to an A for the mezzo-soprano, and Callas must do the C. And the C didn't come out. When we got to the end of the duet, she could no longer do [here Cossotto sings the four ascending notes to the C]. But I couldn't hear this. I didn't know if she sang or didn't sing. I thought, it was better I sing my A calmly, so people won't notice, just in case. Instead, they started to say, 'Look, she sings when the other one doesn't sing anymore!' But, the other one didn't make a sound because she was ill - the voice didn't come out. "Later, Callas, at the end of the second act, said to me, 'Fiorenza, stay tonight until the end, because I am not well, and we will all go out [to bow] together.' We'll make a bit of a good impression is what she wanted to say. 'Look,' I said, 'I can't, because I have to pack, since tomorrow morning I have to leave really early, but let's see.' My hotel was right next to the Opéra. I said, 'I'll manage. I'll go and come back right away.' If she had been angry with me, she wouldn't have said this. Is it true or not? But no one has ever published this! They have never said, 'Callas insisted that Cossotto be present at the end of the third act, that she go and thank the audience.' So, how does one explain this? If I had sung an extra note - something only idiots can assert - she wouldn't have said to me, 'Stay.' She would have been angry. From there it started. Even now, at a distance of forty years, they still speak ill of me. She wanted me the second year, wanted my presence. So, what is all this fantasy? They do it to enrich the books and the articles, and so they damage a person. I tried to help her onstage in every way. I have always been a serious colleague, not a colleague who does harm to people." You don't hear a great many people speak poorly of Cossotto - although some may have cause to - instead, they chose to speak mainly of her voice. Had Cossotto earned an unblemished reputation for herself as a colleague over the years, the Callas story would probably not have stuck. Sadly, this seems not to be the case. People in the business are reluctant to comment about her as a colleague on the record, preferring to praise her voice and suggest that she was difficult or ungenerous. Scotto, who worked with the mezzo from 1957 to 1993, takes a more circumspect, sympathetic view, chalking Cossotto's behavior up to a deep insecurity that produced a streak of competitiveness - and the need to be perfect. "Her part was always very well sung, because she had to be perfect. We grew up together artistically, and she was a great perfectionist, so that the conductor could say nothing about her musically. She would vocalize in the theater three hours before, singing the opera probably three times before she sings onstage. There were moments she made me angry, but I felt it was not done to show off - well, also she was showing off - but more for her inner person, because it was her character. If she had been another person, I believe she would have enjoyed this beautiful career more. I don't think she enjoyed it. And this is terrible." In a 1983 OPERA NEWS interview, the mezzo attributed the onslaught of generic singing - and a seeming embarrassment on the part of young singers to cut loose emotionally - to the age of television and movie acting, as well as to the obsession with "a slender body dressed in a chic manner. It is a stylization that signifies nothing." "The artist is born, and just as he was born in the 1800s, he's born in the 2000s. It's a question of sensibility. Also, there are no longer so many teachers. At one time we studied with the conductor for one month the phrasing, the way of speaking while singing. Now these things no longer exist. When I do master classes, I take care of, above all, that which singers no longer find: the mode of expression of the text, the color of the sound appropriate to a particular word. This is important! If I were a theater director, I would take on one, two artists of a certain age, who would teach all the young artists how one conveys a character, how a character lives onstage. Only by being near these greats can one learn." Perhaps now would be a good time to bring up a certain blog post from The Washington Post's Anne Midgette. Posted just today- Peter Gelb and the Met: still middlebrow after all these years. But I digress... as usual. Happy Belated Birthday, Fiorenza Cossotto! To celebrate, Friendlies, here's a little something for your viewing pleasure. Fiorenza Cossotto as Azucena in Verdi's Il Trovatore - Florence, 1977 - Carlo Cossutta as Manrico - Riccardo Muti conducting. Enjoy! Stumbled upon this page tonight. 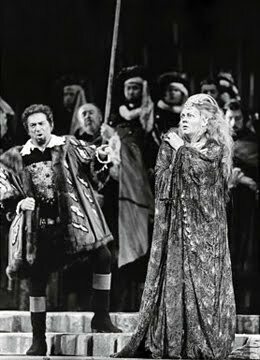 I attended the dress for the TROVATORE with Cossotto & Merrill in 1973 (I think?) At the conclusion of the 'Giorni Poveri' & 'Deh, ralentate o barbari' (in which Cossotto burned down the barn) Merrill completely broke character and started applauding and brava-ing. I was fortunate to have seen Cossotto many times (Amneris, Santuzza, Laura, Adlagisa, Dame Quickly, Principessa di Bouillon, etc.) Best Eboli I ever saw with a 'Don fatale' which drove the public into frenzies. Thanks for the memories and Happy New Year!